A great balance of comedy, practicality and vision. Erik is one of our favorite west coast callers. He plays and calls in Portland OR and all across the country, leading contra dances and English Country dances of all varieties. He enjoys introducing contra dancers to the beautiful, flowing figures of English dances by weaving them into contra dances. He also plays flute with several Portland bands. Vermont caller Will Mentor is in demand at dances all over the USA. His clarity and energy will delight you as he guides you through contras both sensuous and energetic, with a few brain-teasers (foot-teasers?) thrown in for good measure. Will has been described as “a great teacher, endlessly amusing, and someone who has all his calling priorities straight!” With over fifteen years of calling experience, Will has developed an excellent contra repertoire, and is also known for his square dance calling. Crowfoot weaves musical influences from England, Ireland, Quebec, and the Appalachian Mountains into a captivating fusion that delights dancers and listeners alike. Into this meeting ground of traditions, they incorporate their own distinctive original compositions and songs. On the concert stage, rich vocal harmonies, haunting songs, and finely crafted instrumental arrangements compliment their infectious dance energy. Their diversity of instrumentation allows for a wide palette of sound, and audience members are consistently won over by the depth and variety of Crowfoot’s musical experience. They are also awesome campers with unique musical offerings for musicians and dancers alike. As Hammer & String, multi-instrumentalists Rhys Jones, Cleek Schrey, and John Herrmann perform American and Irish traditional music that spans continents and centuries. Exploring the cross-Atlantic boundaries between Appalachia and Ireland, they conduct a musical conversation, with all the texture, sparks and improvisation of virtuosic performers. A guided tour of two closely related musical traditions, and window into a musical journey of mutual discovery, they perform dance music that has been set free from the traditional rules. This crew recently took first place in the Clifftop Traditional Band Contest — the pinnacle of old-time music honors. 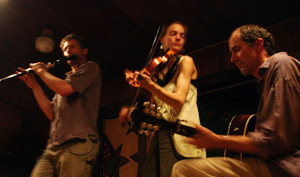 The Avant Gardeners are the creative collaboration of Virginia fiddler, singer, and composer Laura Light and Alaskan wild man George Paul. Laura brings traditional American fiddle styles and swing influenced improvisation to the eclectic compositions of both Laura and George, all driven by George’s electric and groove oriented keyboard wizardry. A nationally touring band with the full complement of Gardeners, as a duo George and Laura are always in demand for dances and workshops, coast to coast. George has been dubbed the king of contra funk as well as the energizer bunny of dance camps. Both love performing but are equally excited about including and encouraging musicians in their growth and explorations. is a versatile musician (bass, guitar, mandolin) from Carlsbad, CA, who has been playing music on various stages since 1974. 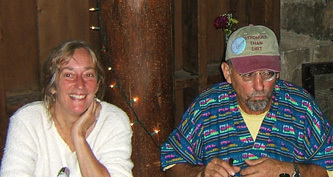 Currently a member of three bluegrass bands: Highway 76, The Tail Draggers, and Superstrings, he also plays in the old-time contra dance band, The Remnants, for the San Diego contra dance community. A devoted old-car nut and sailing enthusiast, he is a staunch and reliably mischievous camp instigator. a valued “gizmo guy,” was a rock-n-roll sound engineer in a former life. It wasn’t long after he started contra dancing that he began twiddling the knobs on the soundboards for dances … and he hasn’t stopped yet.